172 pages | 29 B/W Illus. Over the last decade, policies and financing decisions aiming to support low carbon resilient development within the least developed countries have been implemented across several regions. Some governments are steered by international frameworks, such as the UN Framework Convention on Climate Change (UNFCCC), while others take their own approach to planning and implementing climate resilient actions. Within these diverse approaches however, there are unspoken assumptions and normative assessments of what the solutions to climate change are, who the most appropriate actors are and who should benefit from these actions. 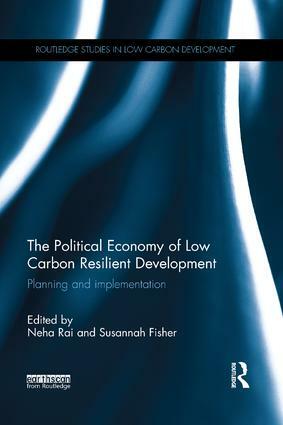 This book examines the political economy dynamics or the underlying values, knowledge, discourses, resources and power relationships behind decisions that support low carbon resilient development in the least developed countries. While much has been written on the politics of climate change, this book will focus on the political economy of national planning and the ways in which the least developed countries are moving from climate resilient planning to implementation. The book will use empirical evidence of low carbon resilient development planning in four countries: Bangladesh, Ethiopia, Rwanda and Nepal. Different approaches to low carbon resilience are critically analysed based on detailed analysis of key policy areas. This book will be of great interest to policy makers, practitioners’ students and scholars of climate change and sustainable development. Neha Rai is a Senior Researcher in the Climate Change Group at the International Institute for Environment and Development (IIED). Susannah Fisher is a Senior Researcher in the Climate Change Group at the International Institute for Environment and Development (IIED).